In the picture above is one of the longest surviving terrariums. It is made and designed by David Latimer who is a retired engineer. We might think that the plants in his terrarium are non-flowery but they are in fact flowery spiderworts – as shown in the picture below. Photosynthesis: This allows the plant to release oxygen by taking in sunlight, water and carbon dioxide. Respiration: The plant releases carbon dioxide after taking in oxygen and water. Hence we do not need to unseal our terrarium. Reason being that there is continuous gaseous exchange of oxygen and carbon dioxide! Water cycle: In the terrarium, the plant releases water vapor through its leaves. This is known as transpiration. Water vapor then condenses and form droplets along the walls of the bottle and the droplets fall back into the soil to be reabsorbed by the plant. Now you might be wondering, ‘Is Mr Latimer’s terrarium still alive?’ Well the answer is a surprising ‘yes’. In fact, it has already survived for a total of 58 years! 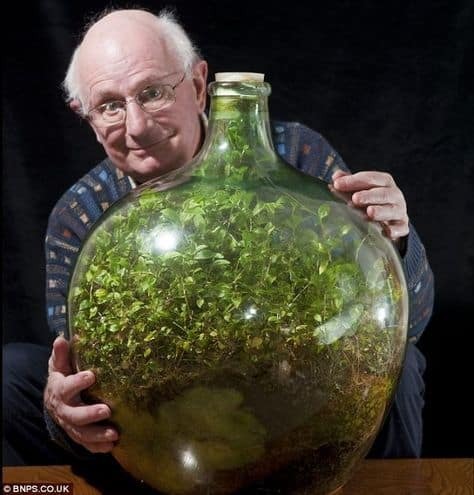 According to Latimer & the ‘daily mail’, he planted it in the year of 1960 and left it sealed up for a total of 12 years. 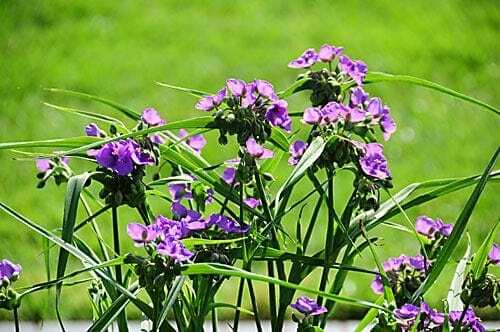 Thinking that the spiderworts are getting drier, Latimer added only 140 grams of water in 1972. http://www.dailymail.co.uk/sciencetech/article-2267504/The-sealed-bottle-garden-thriving-40-years-fresh-air-water.html. After doing so, he left the bottle sealed till this very day. Interested in making your very own bottled-garden now? Feel free to look us up! We at Ecoponics conduct fun-filled and educational terrarium making workshops!